The 2017 Inaugural Bill Guarinello Golf Classic honors the President and CEO’s two passions — HeartShare and golf. The HeartShare Board of Directors honored its President and CEO with an engraved golf bag and congratulatory cake at the event on Tuesday, June 13 at Colonia Country Club. “We had been looking for a way to honor Bill and his achievements over the last 47 years. But what to do? What would be meaningful to, yet appropriate for, Bill?” shared HeartShare Chairman Paul Torre. “In descending order, Bill’s love for his family and friends is abiding. He bleeds HeartShare blue more than anyone. And his love of golf, is profound. On behalf of the Board of Directors, I would like to present Bill with this personalized golf bag to symbolize our official Board decision to change the Golf Classic’s name to The Bill Guarinello Golf Classic,” said Torre. The Golf Classic typically opens with breakfast and concludes with a cocktail hour and dinner at Colonia Country Club. Golf prizes included a 40-inch 4K Smart TV, Visa Gift Cards and gift certificates to the Colonia Pro Shop. Raffle prizes included golf equipment, autographed sports memorabilia, restaurant gift certificates, admission passes to Winterthur Museum and Country Estate, as well as baskets of wine and spirits. The Golf Classic was made possible by the generosity of Maureen Moore and Bob Golden, Celtic General Contractors, Inc., Cheever Development Corporation, John and Mary Martinez-DiGregorio, HSBC Bank US, NA, Kings Auto Group (Alex Trantino), Lamb Financial Group, Loeb & Troper, and Anne and Joe Taranto. To learn more about upcoming events, sign up for HeartShare’s e-mail list at www.heartshare.org. The HeartShare Board of Directors honored their President and CEO with an engraved golf bag and congratulatory cake at the 2017 Inaugural Bill Guarinello Golf Classic. 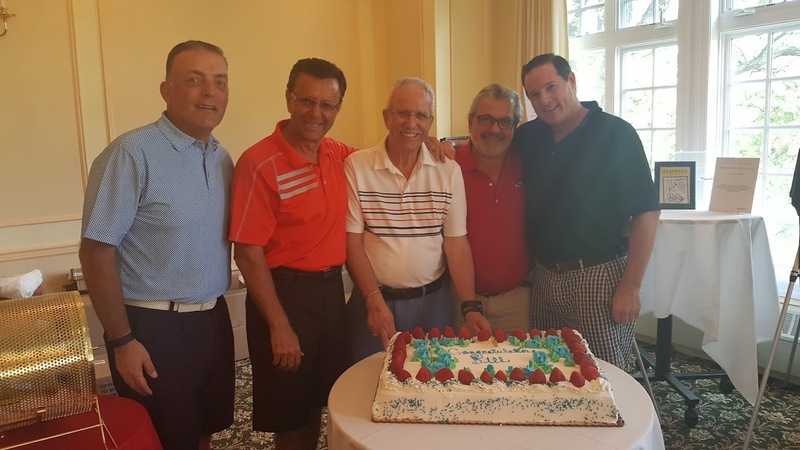 (left to right) HeartShare Board Member Angelo Del Giudice, HeartShare Board Member Sal Calabrese, President and CEO Bill Guarinello, HeartShare Board Member Dr. Ray Mollica, and HeartShare Chair of the Board Paul Torre.